Remembering Louay Kayali: Life Is On The Streets. 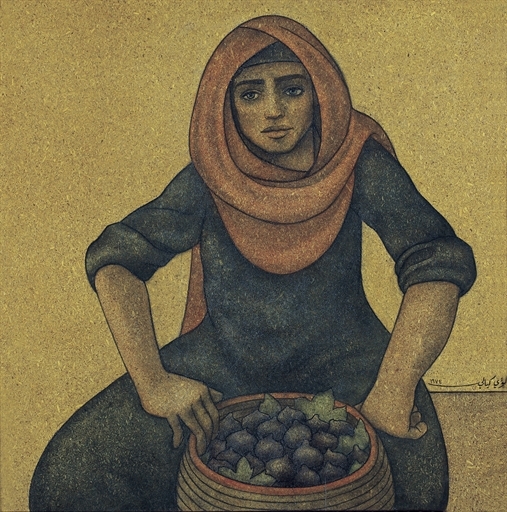 Louay Kayali was a Syrian modern artist, a brilliant painter born in Aleppo in 1934. 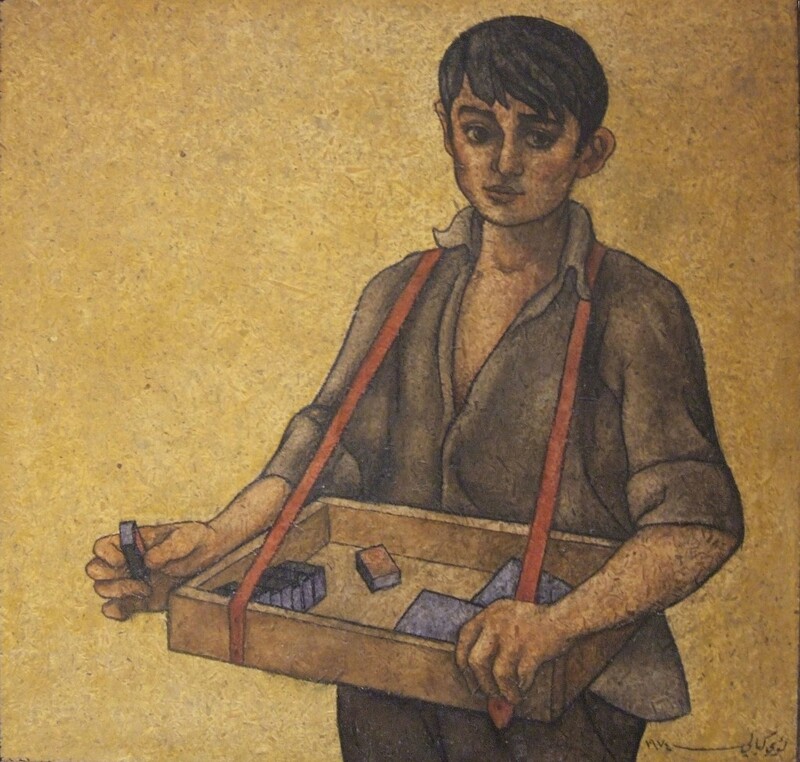 He began painting at the age of eleven and held his first solo exhibition when he was eighteen. Kayali died in 1978, from burns incurred from his bed catching fire, reportedly from a cigarette (he suffered from depression, leaving many to think it was suicide). Kayali studied art at the Accademia di Belle Arti, and met Syrian artist Wahbi Al-Hariri there – they would remain friends for the rest of Kayali’s life (Al-Hariri became his mentor). Later on, Fateh Moudarress (also mentored by Al-Hariri) and Kayali represented Syrian modern art at the Venice Biennial Fair. Kayali graduated in Rome in 1961 and returned to Syria where he started his career as a fine arts professor at Damascus University, where Fateh Moudarres also taught. Kayali’s artwork changed during his life, he was inspired by various things and made beautiful paintings of still nature and village landscapes, but what moves me deeply when it comes to his work are his painting of “ordinary” people, the way he captured life on the streets. When Kayali made his atrwork about the people around him, people we pass by every day, people that are not often thought of as important, as the ones that deserve attention – that is when his art became so powerful, it became a statement of resistance, a portrait of struggle that cannot and should not be unseen. His ways of capturing the psychological condition of the people, the harshness of life in the way they hold their bodies, the way they look at you – it is a true skill, it is a way of seeing and understanding people, not just trying to paint them. In that sense, his portraits of people in the streets of Syria, the relationships he made, can be compared to those of Vincent Van Gogh and the miners he lived with and painted. 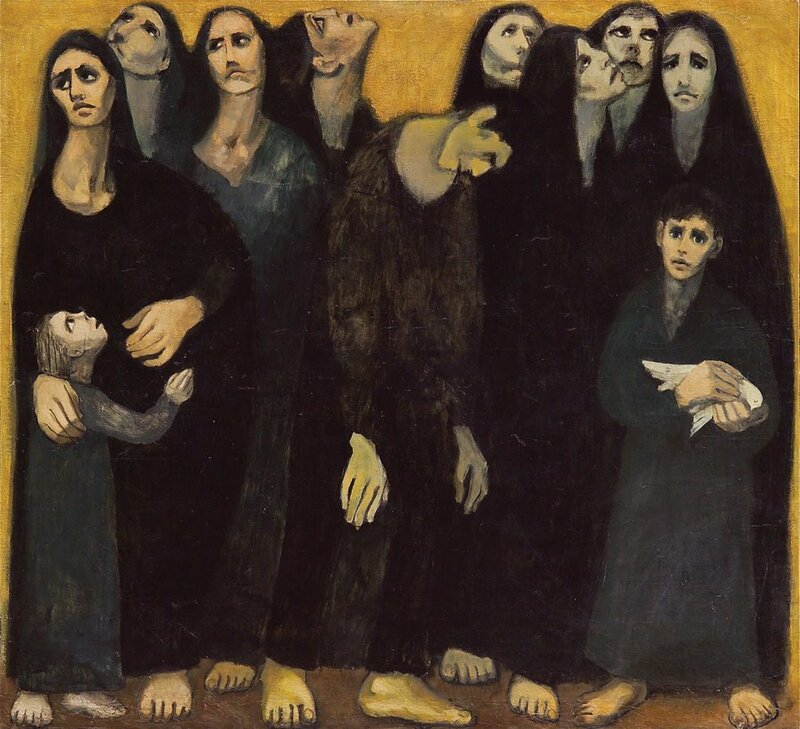 Kayali is also famous for capturing the agony and the decampment of Palestinians in his paintings, particularly during the 1967 war. 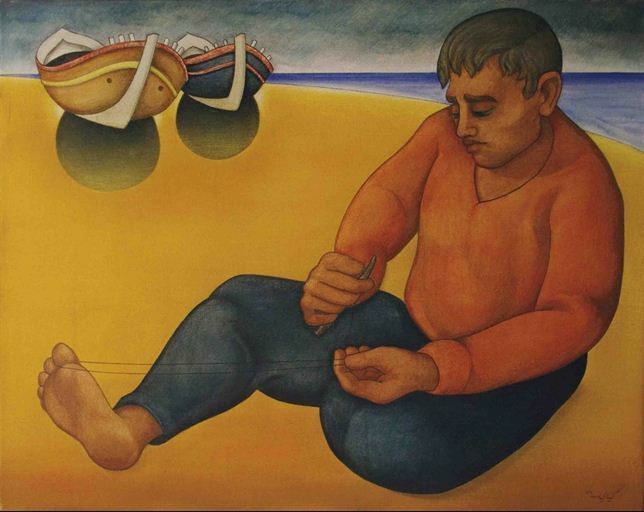 His painting Then What shows Palestinian refugees, barefoot and disoriented, and it remained one of his most powerful works. You can see the misery, you can feel the despair. 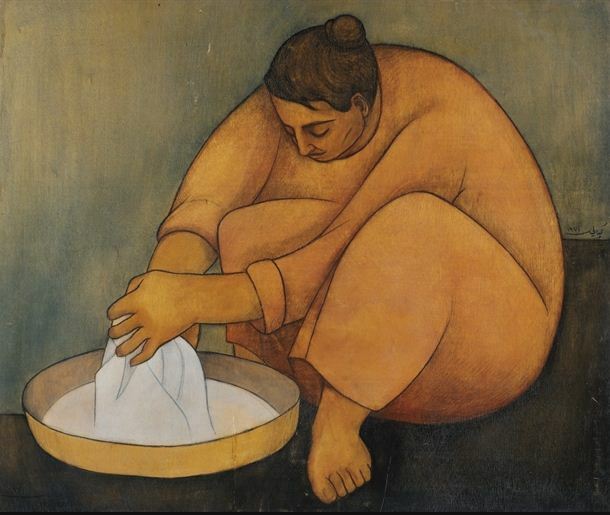 In his work, Kayali did not adhere to the idyllic image of national heroes, and his shift towards “everyday” people did not go without criticism. After all of the turmoils and attacks, in 1977 he decided to leave for Italy, he sold his house and left Syria, dreaming that he would work on his art in Rome, in a more peaceful atmosphere. But he couldn’t do that and he returned to Aleppo, to live in solitude. 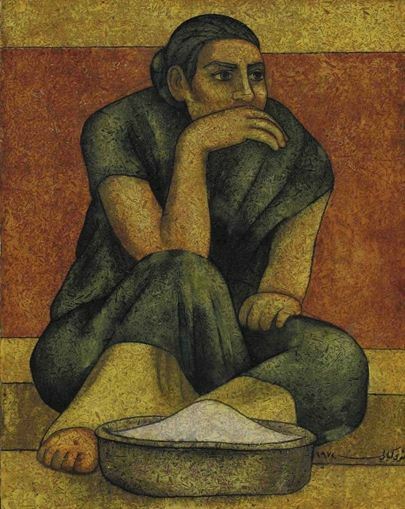 He died in solitude, but in his work all of the connections he made remain visible. He cared about people deeply. He was a keen observer of life, a mad person, a genious, a humanist not well understood in a world that is very often so far from humanistic values. He made sure we remember and notice the bread makers, fishermen, ice cream sellers, corn sellers, match sellers, bead sellers, fig sellers, socks sellers, flower boys, flute players, shoe-shine boys, oud players, cleaning ladies, beggars, refugees, single mothers…. That is why we should remember Louay Kayali. → Playlist: Maghawir By Mashrou’ Leila. ← In Defence Of M.I.A. Life is indeed on the streets, thank you for the post, Louay Kayali’s work was so true and so authentic.